Following on from the recently revealed Insignia Grand Sport, Vauxhall has launched - drumroll sound effect - the Insignia Sports Tourer. Yes, it's basically the estate version of the new Insignia and will go on sale in the UK this autumn, priced from around £23,500 we reckon. It's bigger than before and has more overall carrying space too - up by 100 litres to a total of 1638 litres, which is more than a Ford Mondeo Estate if you're counting. The boot is also longer and wider than before. The increase in size means more room for passengers with better headroom and more width. The rear seats fold down via a button in the boot and there's the option of an electric tailgate that opens with a swish of your foot under the rear bumper, something we've seen from Volkswagen and Ford. There is also a panoramic sunroof available. 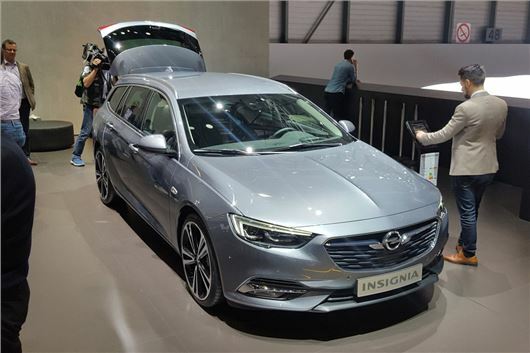 Yet as is the story with modern cars, the Insignia Sports Tourer is lighter than before. Around 200kg in fact, which is a significant reduction. This should mean benefits for both handling and economy. Engines will be 1.6-litre and 2.0-litre diesels, along with turbocharged petrols. Most variants will be front-wheel drive, but there is also an all-wheel drive option with torque vectoring. A new eight-speed automatic gearbox will also be available. Top models will come with heated front and rear seats along with a heated steering wheel, similar to high-spec Kia Optima models. Other features include a head-up display, adaptive cruise control along with Apple CarPlay and Android Auto. Meanwhile, the Insignia Sports Tourer is also the first Vauxhall to have an active bonnet. This is designed to improve pedestrian protection in the event of a collision.